When Nic Fallowfield began conducting in 1990 it was from the standpoint of a player with ten years of orchestral experience. Directing concerts from the violin with the English String Orchestra proved rewarding and yet frustrating - inasmuch as when playing it is difficult to effect subtleties of musical direction and balance - and the logical step was to put down the violin and learn how to use a baton. In 1990 Nic embarked on an intensive period of study with George Hurst, both privately and in the well-known Conducting Class at Canford (now Sherborne) Summer School of Music. During this time (1990-1995) he developed a style and technique which is now widely praised as both supremely efficient and highly expressive. Nic has always placed great value on the work he does with young musicians. For many years in the early 90’s he was conductor of the award-winning string orchestra of GAMPA (Gloucester Academy of Music and Performing Arts). He conducted several courses in Belgium for JESTA (the junior branch of the European String Teachers Association) and in Greece, where the Sani International Festival Orchestra drew young players from eleven different European countries. 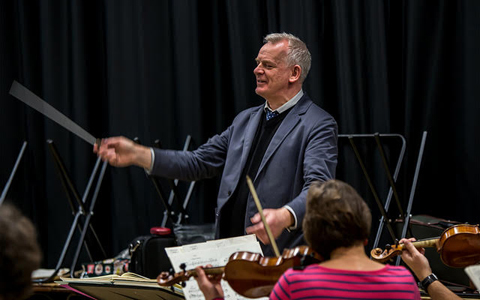 He conducted seasons with the county youth orchestras of Herefordshire (2001-2002) and Warwickshire (2002-2003) and has been conductor of the Four Counties Youth Orchestra in North Wales since 1992 (when it was still Clwyd Youth Orchestra). Nic was invited to make his professional debut in 1992 in a series of concerts with the Jvaskyla Sinfonia in Finland. There soon followed a first professional engagement in Britain with the East of England Orchestra (later to be re-named as sinfonia ViVA): performances of Mozart’s Symphony no.40 and Tchaikovsky’s Serenade for Strings were greeted with acclamation by both audience and players. Further concerts with this orchestra soon followed and Nic has conducted them regularly ever since. While pursuing his conducting activities Nic has always maintained his orchestral playing links (mainly as co-leader of sinfonia ViVA) and is convinced that this has given him invaluable insights into what it is that an orchestra needs from a conductor.